Darren and I had to take some short-cuts today because of a dinner commitment and our late start for the rugby – a fantastic spectacle; maybe not one for the purist (nor the Kiwi landlord of the Slipway “This place will be closing if the All Blacks lose“) but certainly great for the simple fan! It seems as if we’ve now hit seaside holiday central, with lively and lovely beaches along this stretch, such as the sandy bays at Trevone, Harlyn and Constantine. On each there was a great variety of shapes and sizes and colours, with everyone enjoying uncomplicated beach fun as we walked through, self-consciously rather overdressed. We passed the small but perfectly formed Port Quin, the intriguing but sad-looking bee centre nearby, and the pretty church at St Enodoc which is surrounded by the golf course and is the resting place of John Betjeman. 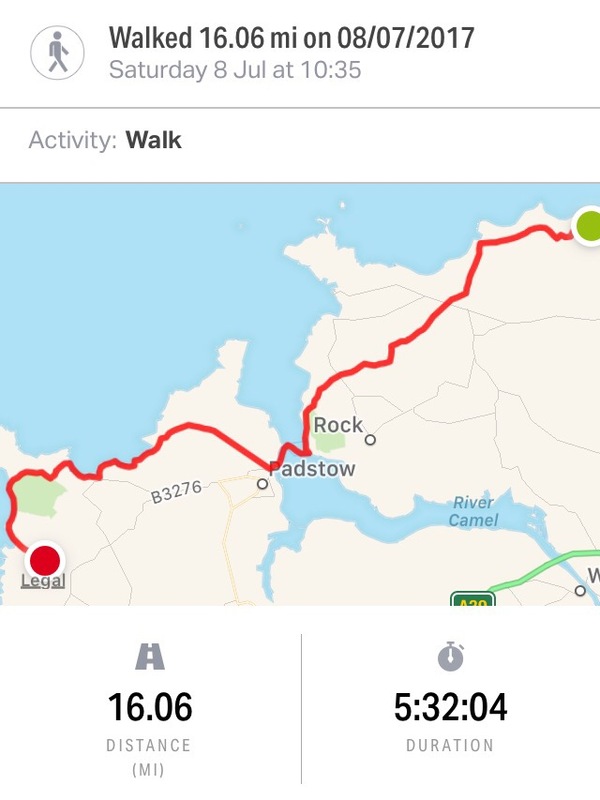 We had a pasty in busy Padstow, leaving via Prideaux Place with its ancient deer park, and across fields chopped off the headlands at Gunver and Trevose Heads so that we were in time to be collected by my pal, Steve, from our youth hostel at Treyarnon. Steve is another ex-WRG waster who I’ve known since we were both serving our rubbish apprenticeships. He and Karyn have rented a house at St Issy and invited us over for dinner with their extended clan. It’s the first time I’ve been invited to take my dirty washing to dinner but a wash and dry was much-needed. Karyn also asked me if I’d like a shower so I did wonder if, in spite of my stringent bathing, I was still carrying the lingering odour of wandering tramp …. Josh took the photo of us all. He’s a budding film-maker and has suitably long arms for a wide selfie. John Betjeman did write about St Enodoc church, but my favourite is Miss J. Hunter Dunn, Miss J. Hunter Dunn, furnish’d and burnish’d by Aldershot sun….. So evocative and slightly suggestive. Is that a misspell of Sun? Chris, It appears your brief brush with stardom on Friday has thrown the whole blog into disarray – I’m reading Saturday’s walk details on Sunday night. Think you need to catch up otherwise those of us waiting on tenterhooks for the final triumphant blog on THURSDAY evening are going to be very disappointed. Only 4 more days to go – make sure you enjoy the last hours of a magnificent achievement. Lord only knows what Sir John would have made of Luton . Peddle to the metal Chris , they will be dancing in the streets of Babbacombe on Friday night and you had better bring your dancing shoes .